Have you ever had to choose between being The Joker or Freddy Krueger for Halloween? If you have ever found yourself in that predicament at some point in your life, you need not worry any longer, because there is now a Freddy Krueger combined with The Joker Halloween mask and it's as creepy as you're imagining right now. And don't worry, before you ask, it's not Jared Leto's version of the Clown Prince of Crime. Instead it looks more like the mask is based off of Brian Bolland's illustrations for Alan Moore's Batman: The Killing Joke. The new mashup mask answers the question: What would it look like if The Joker were burned alive instead of Freddy Krueger? 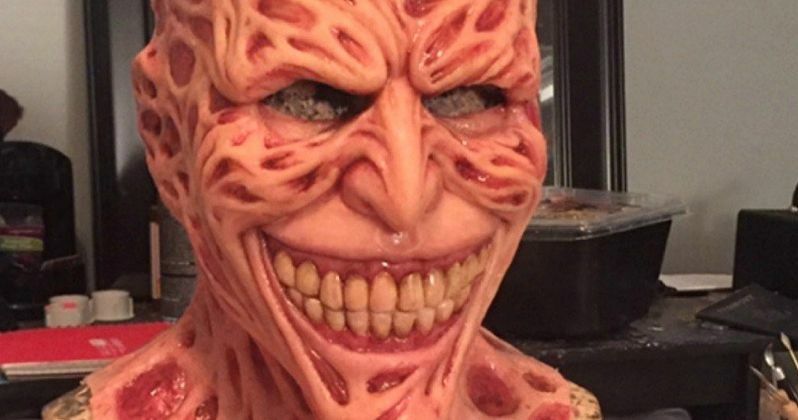 The unique overhead mask is made from silicone and it has The Joker's signature features, but filtered through the gore of Freddy's burned flesh as seen in A Nightmare on Elm Street. The mask is made by DarkBlackFX and is available for $500 dollars, which may seem a bit expensive, but the incredibly cool mask is made-to-order and truly one of a kind and unique. It really is the perfect fusion of the New Line slasher icon and Gotham's big bad. There have been little mashups of the character before on the internet, but nothing as cool as the mask that DarkBlackFX has created. Fans of both of the villains have turned online forums into warzones debating who would win in an ultimate battle between The Joker and Freddy Krueger. The arguments are often ridiculous since we're talking about two fictional characters from two very different franchises, but they're pretty fun to read. Though nothing official has ever brought the two together, what would happen if the two met in a dark alley? The idea of them fighting against each other is a good talking point, but Freddy Krueger has to have the edge on this one, right? He's already dead and is basically a serial killing demon who can pretty much do whatever he wants, but he does have a penchant of playing with his victims before killing them, which could be seen as a weakness and way for the psychotic Joker to step in and take ol' Freddy out. The Joker would certainly not be scared of Freddy and in addition, Freddy has been known to be killed by teenage girls. The Joker might have this one on lock. Regardless of who would win in a hypothetical battle between two fictional characters, the Freddy Krueger and Joker mask will certainly win some Halloween costume contests. Maybe pair up with a Harley Quinn and Godzilla mashup and there will definitely be some awards heading your way, without a doubt. If you're interested in purchasing one of the made-to-order masks, hit up the DarkBlackFX Etsy page and place an order as soon as possible to have one in time for Halloween. The site does not mention how long it takes to have one made, but the quality look leads one to believe that it takes quite a while. Check out images of the mask over at DarkBlackFX.